The Ultimate Fighting Championship returns to Atlanta with not one, but two interim titles on the line. So who is going to walk away with the belts? UFC 236: Holloway vs. Poirier 2 is topped by an interim lightweight title fight between current featherweight champion Max Holloway and top contender Dustin Poirier. The winner will be crowned the interim titleholder and slotted as the next challenger to lightweight champion Khabib Nurmagomedov when he returns to the cage later this year. It actually marks the second time the two have fought, although it has been quite a while since they shared the Octagon. Holloway and Poirier last fought more than seven years ago, with Poirier winning. Since that time, Holloway has run away with the UFC featherweight division. Poirier hasn’t been on quite the streak that Holloway has, but returned to lightweight a few years after defeating Holloway, and is currently on a run of 8-1-1, including three consecutive wins over Anthony Pettis, Justin Gaethje, and Eddie Alvarez to put himself in title contention. The UFC 236 co-main event pits Kelvin Gastelum against Israel Adesanya for the interim middleweight title with the winner getting a crack at current champion Robert Whittaker. Gastelum was supposed to have already fought Whittaker for the undisputed middleweight title, but was derailed the day of their fight when Whittaker had to be rushed into an emergency dual surgery because of a hernia and collapsed bowel. With Whittaker out of action for the next few months, the UFC moved swiftly to put Gastelum in a fight for an interim version of the title. Adesanya and Anderson Silva stepped up when Whittaker dropped off the bill to give the Australian fans a UFC 234 main event. Though Silva fought a solid fight, Adesanya lived up to his promise leading the next wave of middleweight contenders. After Adesanya defeated Silva, the UFC matched Gastelum and Adesanya for the belt in the UFC 236 co-main event, which takes place on Saturday in Atlanta. Though Gastelum has been a contender for the belt much longer than Adesanya, oddsmakers aren’t betting that he’ll walk away with the belt on Saturday. The UFC 236 main event has a slightly wider gap, with Holloway expected to avenge the loss in their first bout and become the UFC’s next double-champ. Holloway was a -205 favorite on Thursday with Poirier at +165, expected to lose the fight. 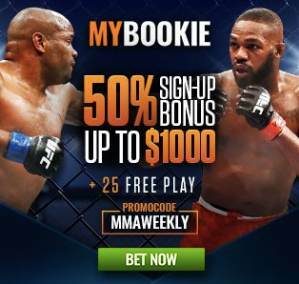 If you’d like to take a closer look at the UFC 236 lines and prop bets or any of the other MyBookie lines, be sure to use the promo code MMAWEEKLY if you sign up to get your 50-percent sign-up bonus.